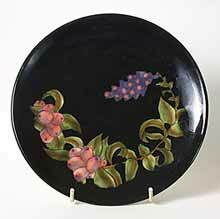 Black Cobridge plate - 8½" (215 mm) diameter. 1998. Cowberry design. This is a trial piece - production pieces had a creamy-white background.